Please be advised that due to high water conditions and to ensure public safety, the entrance to the point and the wetland trail walk have been closed. During the course of a facility improvement project in 2014, BC Parks uncovered an important archaeological site within the campground. With sẁiẁs Provincial Park now an archaeological site, the Province and Osoyoos Indian Band (OIB) have agreed that sẁiẁs and sx̌ʷəx̌ʷnitkʷ Provincial Parks will be managed by the OIB. Park visitors can expect the same recreational opportunities as before. BC Parks and OIB continue to collaborate on management that will ensure the long term protection of the cultural heritage values in the park and the strengthen their government to government relationship. sẁiẁs park is proudly managed and operated by the Osoyoos Indian Band. 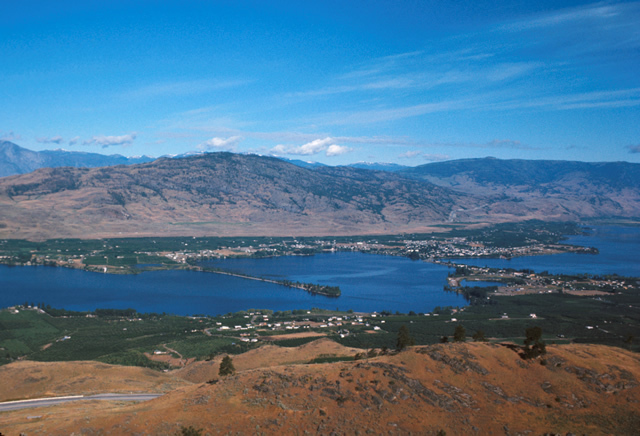 sẁiẁs park is located within the traditional territory of the Osoyoos Indian Band. Since time immemorial, the Osoyoos Indian Band’s Okanagan ancestors have inhabited and cared for the lands and waters within their traditional territory. In 2015, the park was renamed to reflect the traditional Okanagan place name for the area. The nqilxʷcən/nsyilxcən place name and history of sẁiẁs have been passed down for thousands of years through the oral tradition of capti’kʷl stories and teachings. sẁiẁs sounds similar to “s-wee-yous” and means a place where it is shallow or narrow in the middle of the lake. The place name explains how the area was used to cross Osoyoos Lake by foot or by horse. Lakeside campsites and privacy make this one of the most popular provincial parks in the province. Campers are encouraged to book reservations early in the season to secure campsites during the busy summer months. Special features: sẁiẁs park is an important archaeological and cultural heritage site. Please help respect and protect this historically and culturally important area by following the park rules. Park guests are also reminded that the Heritage Conservation Act protects all archaeological and cultural heritage sites in the province. This includes intact or disturbed, known or unknown, recorded or unrecorded sites. Special Notes: Due to popularity and size of the campground, there is a maximum stay policy of 7 nights per calendar year in this park. Reservations are made through BC Parks’ Discover Camping reservation system. The extremely hot, dry Okanagan climate can result in overexposure to the sun. Children and adults should use a sunscreen and wear a hat during long periods in the sun. Caution: Campers and swimmers should be aware that extreme caution is required when swimming or walking in the shallow water surrounding the park. There is potential for dangerous undercurrents. Extremely steep drop offs surround the exposed sandbar at the tip of the point. Children should be supervised at all times. Swim, wade or walk in the water at your own risk. Caution: sẁiẁs park is subject to severe and unexpected winds on occasion. Please ensure that all tents and equipment are tied down at all times, to help prevent damage. Caution: sẁiẁs park contains significant amounts of poison ivy. Park guests are encouraged to become familiar with this plant and avoid any contact. Audio Files: The nqilxʷcən/nsyilxcən place name for sẁiẁs park was recorded by Osoyoos Indian Band Elder Jane Stelkia and Westbank First Nation Elder and language teacher Delphine Armstrong. Jane’s nqilxʷcən skʷist (traditional name) is qʷʕayxnmitkʷ xʷəstalk̓iyaʔ. Delphine’s nqilxʷcən skʷist (traditional name) is ɬək̓əmxnalqs. Campsite reservations are accepted at this park. Located two km South of Osoyoos off Hwy 97 onto 32nd Avenue. History: The present day park was created on May 17, 1962. In 2015, the Province and Osoyoos Indian Band agreed that the Osoyoos Indian Band will manage sẁiẁs park. Cultural Heritage: The archaeological and cultural heritage values at sẁiẁs park tell an important story about how the Osoyoos Indian Band’s Okanagan ancestors used sẁiẁs as a crossing area, cultural use, and habitation site in the thousands of years prior to the arrival of European settlers in the region. The Okanagan ancestral remains that were disturbed and reburied on site are the oldest on record in the Osoyoos region (approximately 1,224 years old). Radiocarbon testing of faunal (i.e. animal) materials recovered from a shell midden provided important information about the diet of the Osoyoos Indian Band’s Okanagan ancestors 3,265 – 4,475 years ago. Obsidian flakes retrieved from the park were analyzed to be from the Whitewater Ridge in Oregon. The presence of the flakes in the park affirms the travel and trade routes of the Okanagan People along the Columbia River Basin. The cultural heritage values in the park include opportunities for the ongoing continuance of Okanagan culture through traditional, ceremonial and cultural use of the area. The old Hudson’s Bay Fur Brigade Trail also passed through the area nearly two centuries ago. OIB and BC Parks are working in partnership to ensure the long-term protection of the archaeological and cultural heritage resources within sẁiẁs park. Conservation: The park protects species and ecosystems at risk such as peach leaf willow, antelope brush-needle and thread grass and wetlands. Wetlands are rapidly disappearing in the Okanagan Valley. The marsh area and self-guided interpretive trail are important features of the park. Wildlife:The marsh area of the park is home to a variety of wildlife. Blue-listed species include the Western small footed myotis bat, barn owl, spadefoot toad and painted turtle. The tiger salamander is a red-listed species that calls the park home. There is currently no approved management plan for this area. The Osoyoos Indian Band and BC Parks are working in partnership to identify resources and opportunities to develop an innovative management plan for the park. Canoeing and kayaking can be used in the lake surrounding this park. There are 43 different species of fresh water fish in the lake i.e. trout, kokanee, large and small mouth bass, lake whitefish, etc. Anyone fishing or angling in British Columbia must have an appropriate licence. sẁiẁs Provincial Park contains a natural marsh rich in birdlife such as canyon wrens, marsh wrens, white-throated swifts and red-winged blackbirds. A gravel trail leaves from the information kiosk and enters the marsh. The gravel trail crosses a footbridge that spans a beaver dam isolating the marsh from the lake. It continues through level grassland rimmed by marsh vegetation with interpretive signs along the way explaining the value of marsh ecosystems. The trail leads to a two-tiered viewing platform that is roughly ten feet tall and provides a commanding view of the marsh. It is a wonderful spot for viewing the variety of red and blue listed species that are a feature of the park as well as other birds in the area. The platform is eight feet by eight feet with a railing enclosed by plastic link fence for safety. There are two benches underneath the platform. The trail continues on to 80m of boardwalk and two more ground level viewing platforms with more educational signs. For your own safety and the preservation of the park, obey posted signs and keep to designated trails. Shortcutting trails destroys plant life and soil structure. To protect this sensitive ecosystem, no dogs are permitted in this area. Pets/domestic animals are not allowed at all along the trail and boardwalk in the wetland area, near the entrance to the park. Pets/domestic animals must be on a leash at all times and are allowed on the pebbly pet beach found on the narrow, tree lined part of the spit just before the campground. Pets are not allowed in any other beach areas or park buildings. You are responsible for their behaviour and must dispose of their excrement. Backcountry areas are not suitable for dogs or other pets due to wildlife issues. There are no lifeguards on duty at provincial parks. Surrounded by warm water and sandy/gravel beaches, this park is excellent for swimming and other water oriented activities. There is also a pet beach designated for pooches. The warm waters of Osoyoos Lake are popular for waterskiing. Please obey posted signs regarding border crossings and marked shallow areas. There is a viewing platform along the marsh trail. There is a single launch; concrete ramp, shallow, rocky. The parking lot beside the boat launch is for vehicles with trailers only. Check with US Customs prior to going to USA on Osoyoos Lake; Boaters be aware of narrow channel at end of Haynes Point, so stay between yellow markers. Boats must stay out of marked swimming areas. Marinas in Osoyoos for private boat rentals. There is a flush toilet at the boat launch. This park has a day-use/picnic area. A narrow, shaded terrace with tables overlooks the sandy beach and north to Osoyoos. Cottonwoods separate the tables from the beach. There is plenty of paved parking and two small wooden change houses just off the narrow beach. This park only has flush toilets – no pit toilets. This small park offers 41 vehicle accessible campsites, seven of which are double sites. Campsite reservations are accepted for all sites. Reservations are strongly recommended for all weekend from May through September and any dates in July and August. If a site is not reserved for that evening, a green “available for 1 night” sign will be placed on that site indicating that it is available that night. The maximum length of stay is seven days due to the size and popularity of the campground. Access to the boat launch remains open year-round. The sites are large with level gravel pads, picnic tables and fire rings. The many of the sites can accommodate larger RVs. Most of the sites are right on the lake, one of the attractions of this park. The landscape is open with sites being separated by pockets of beach and scattered cottonwood and Ponderosa pine trees for shade. The inner campsites and those at the tip of the spit are in thickets of shrubs that offer more privacy and shade and the opportunity for bird watching. The nearest services are in Osoyoos and there is a phone in the campground near site #10. Guests with reservations: Check reservation board at campground entrance for pre-assigned site number. Guests without reservations: Check the reservation board for sites that may be available on a first-come, first-served basis or for one night only. Special note: during peak season, reservations are highly recommended as first-come, first-served sites are available on a minimal basis only. BC Senior’s Rate (day after Labour Day to June 14 only): $16.00 per senior party/night. Read the User Fees Policy for information on Senior Camping Discounts.